Australians are concerned about the environmental situation of Australia. Many ecological observances were created to raise public awareness of environmental issues. One of these observances is National Tree Day in Australia, that is annually observed on the last Sunday in July. National Tree Day was started in Australia by Planet Ark, an Australian non-profit environmental organization. The organization was founded in 1992 to help people find simple ways to reduce their impact on the planet. The organization is known for its four major ecological events, and one of them is National Tree Day, that is annually observed since 1996. Annually Planet Ark invites all activists, adults, children, organizations, schools, councils, national parks and all nature care organization to participate in its tree planting event. Every year this event involves thousands of people, who plant trees in more than 4,000 sites. Since the first observance of National Tree Day 21 million trees and plants have been planted, all of them are still growing, and more than 3 million people have participated in these events. 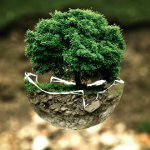 Planet Ark's Tree Day is not only about planting trees. Every year the organization is looking for stories and photographs about Australians' Tree Day, the best of them can be read at www.treeday.planetark.org.